This quilt was hanging in the classroom while it was being constructed, everyone could not get over how dramatic it was. 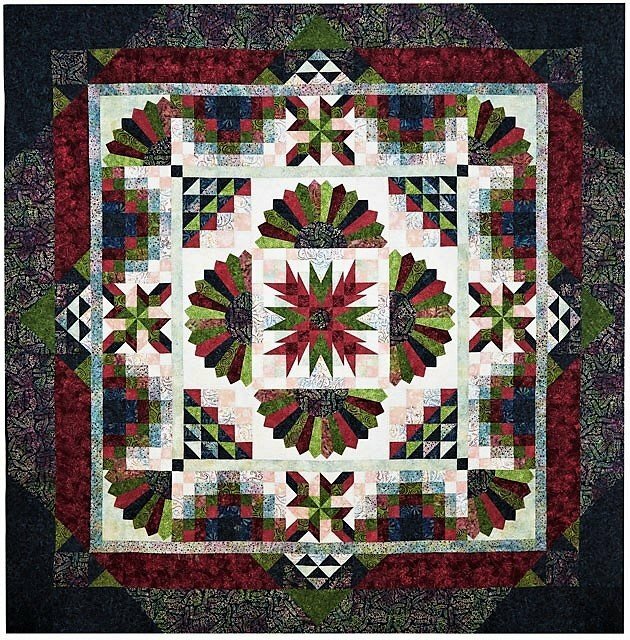 Make this stunning 108" Tonga Lush quilt. It will be a monthly series for 11 months. You will receive all the help and instructions your need to construct the interior blocks and border series during the class session. 14 gorgeous batik fabrics in a palette of creams shading to soft blush, rose, burgundy, and vivid greens set in a navy-blue base. Dresden and fan blocks add interest, the points can be finished by simple machine appliqué or hand. The blooming effect center block points are easily made with the paper templates included with the pattern. This class will surely fill up quick, so grab your space now.